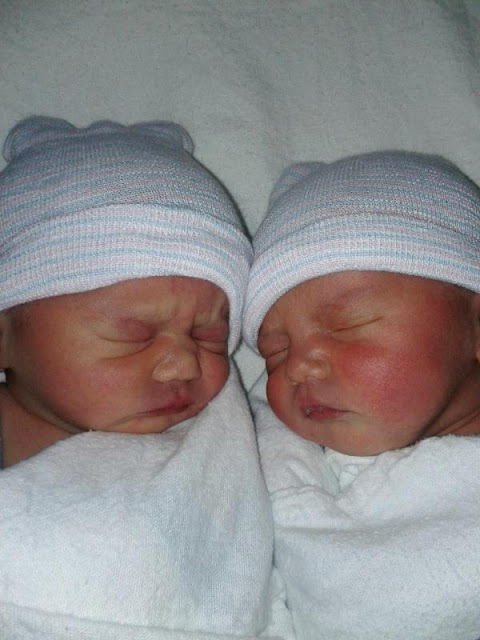 Lily Hope and Harper Grace were born around 9:30am on 2/12/2013! (I just love their names - just so fitting for two cute little bundles.) They were both in the 5lb range which is just excellent for twins. I give Kelly a LOT of credit for carrying them to 37 weeks. Neither baby needed any extra assistance so they avoided the NICU and should get to go home with Kelly when she is released later this week. I cannot wait to meet them!!! But I will let Kelly decide when it's okay for us to visit - with or without kids. She's recovering from a c-section and that by itself is a lot but with trying to get going with breastfeeding TWINS and caring for TWINS, I can only imagine she'll need some space and time to adjust. My kids, as expected are just thrilled and cannot wait to hold them - especially the girls. I can't wait to snap some photos of them all together and some of just the babies. There is nothing like newborns. I am so happy for Kelly and Jesse - they are going to be wonderful parents! My kids adore their aunt and uncle and I only hope that I can have as close a relationship with my nieces as Kelly and Jesse do with my kids. Love their names! Congrats to your family! Cousins!!! Finally!!! OH MY GOD! THEY ARE GORGEOUS! I love their names!!!! Congratulations on becoming an AUNT!! !